Whether you are a private individual, a small or large-scale commercial property developer or business owner, our range of WPL sewage treatment solutions are designed to meet your needs. WPL designs, manufactures and supplies a wide range of sewage treatment plants, from compact package plants to large-scale modular sewage treatment systems. 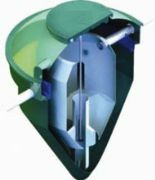 Their cutting-edge, ‘off-the-shelf’ package plants offer environmentally-friendly, legislation-compliant solutions that are simple to install, easy to live with and economical to maintain, while the bespoke solutions are tailored to your exact requirements and will effortlessly deal with all your sewage treatment demands. Small – package plants are pre-designed for use in domestic properties, from single dwellings to small groups of houses, with a population of 1-55 persons. Municipal/industrial – we will design and manufacture a sewage treatment system that answers your specification, no matter how demanding or how large the throughput.